Every nerd knows that San Diego Comic-Con happened recently. And for you non-nerds, San Diego Comic-Con is great big geek fest of fun. To add to the fun and funkiness this year, a Batusi Batman toy was released. Making it even more fun, the fact that Shag did all the art for the toy box. It's a cheeky celebration one of the more embarrassing moments in Batman history. But the Shag art is as perfect as always and seeing his version of the old-school Batmobile is a little bit of a dream come true. 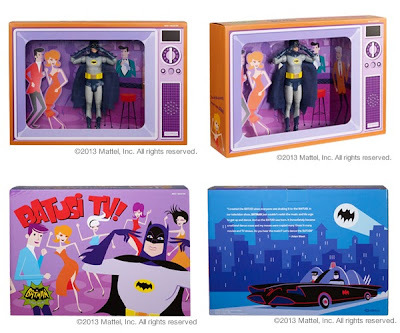 Plus, the people in the box dance the Batusi with Batman.